AIB are launching the "AIB Future Sparks Festival", soecifically designed to introduce Senior Cycle students to the inspirational world of careers in business. This interactive educational event will take place on Thursday 22nd March 2018 in the RDS main Hall + Shelvbourne in Dublin. First 30 names to Ms. Farren before Friday 1st DEcember. 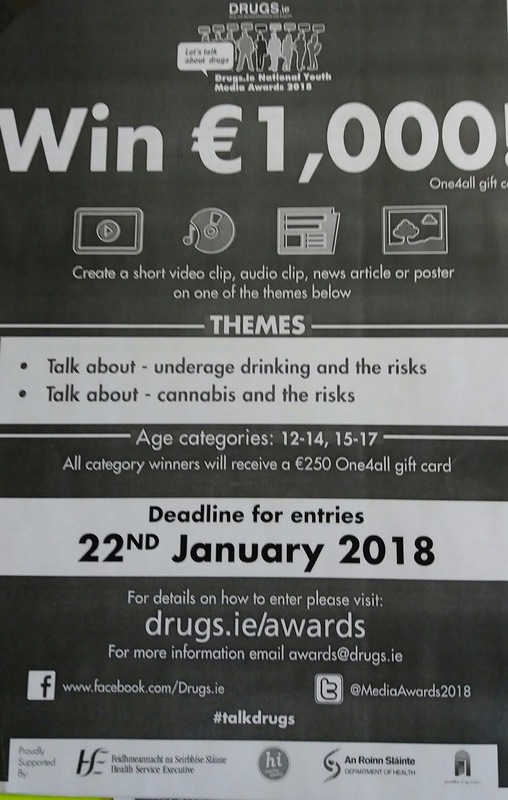 Will open entries in January 2018. We want you to get creative by telling us the story of your stuff—all you have to do is pick an object ( any object), research its life story ( how it’s made and what it becomes when it’s recycled), and visually tell us its story. 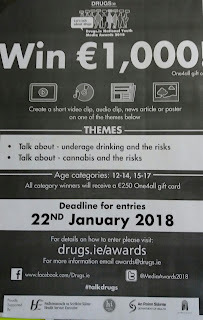 We look forward to lots of wonderful entries!. Check out The story of a Pencil, the story of an apple, the story of an orange. Registration for the Young Environmentalist Awards 2018 closes this Friday 24th Nov.
As part of the Lifeline's White Ribbon Campaign , on Thursday 23rd Nov. the TY's will be hosting a Soccer friendly with Moville Communtiy College. All Transition Year Students will be given the unique opportunity to participate in a Careers Talk Day on Friday 24th November. 5B are organising the event and to date have 21 guests invited form all different backgorunds/education/ careers. It will be an interesting day. Get the questions ready! DCU School of Physical Sciences will host a workshop on Spectroscopy and Optics for secondary level students. This will take place in Dublin on Wednesday 13th and Thursday 14th December. Any students interested let Ms. Farren know before Wednesday 29th November. A few updates for Campaign Academy, Donegal. Max Number - 7 students from the school. Anyone interested let me( Ms. Farren) know before Wednesday 15th November. First session is An Grianan Hotel, Burt. As for the date, I am hoping to hold session one on Tuesday 9th January and it will run from approximately 10am to 3.00pm. After this session, students will need to begin planning and carrying out there in school/community campaigns. After our first session, we will find a date for the next session. All sessions will be fully supervised by Concern members of staff who are Garda vetted – we are delighted if you or another member of staff are able to come along with your students but appreciate that getting substitution can be a challenge. You Once the venue is confirmed, I will send out permission slips which need to be completed for each student. In terms of the residential, I am trying to find a centre which is half way between both Donegal and Dublin to cater for both campaign academy in Dublin and Donegal. I will keep you updated on this but this hopefully will take place late January time after discussion with all teachers involved. Finally, if you could let me know the names of the students that you wish to take part. We can take a maximum of seven from each school. I understand that this is a small number, but the aim is that the students who come along will get the rest of their peers involved! The European Youth Parliament conference in Galway City is now OPEN for all TYs and 5th years. For those that were having issues with the PayPal link, we have attached a new link in the registration form below. More information about the European Youth Parliament can be found in the booklet attached below.